The Conservation Center is proud to be part of a vast community of individuals and institutions dedicated to conserving the past. We recently had the opportunity to work with such an institution, the Oak Park Public Library, to help conserve a part of their history. When Oak Park Public Library (OPPL) called us, they explained the piece in discussion was one of only two remaining windows from the Scoville Institute, a precursor to OPPL. The window – nicknamed "The Scoville Window” – was one of the pieces saved from the original 1888 library building. The window had been on display in the Special Collections Reading Room since 2003, when the newly-constructed library had reopened to the public after several reconstructions. After further research, we were fascinated to learn that the window serves as the logo for the Special Collections Department. “Special Collections has chosen the window for its logo as a way to highlight the Library's commitment to house and provide access to its historic collections that reflect local, regional, and national history,” shared Leigh Tarullo, Manager and Curator of Special Collections. The Center’s art handlers went to the library to carefully retrieve the window and bring it back to The Center for treatment. We found that the frame of the window had split at the proper left bottom corner, leaving a ¼” gap, and the caulking material exhibited signs of failure. The frame itself was constructed using a method that allowed for considerable expansion and contraction. With the right amount of humidity, the frame could have either shrunk enough to cause the glass to buckle or break, or expand enough to allow the glass to fall out. After careful examination, our conservation team decided that the best way to proceed would be to fabricate a new frame using a construction method that would mitigate humidity-related issues. After the window was taken safely from OPPL to The Center, our conservators carefully removed the glass from the frame. Next, they created a template for the fabrication of the new frame. 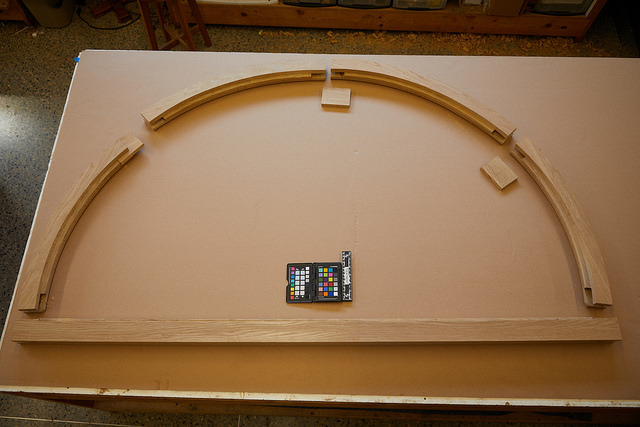 The new frame was fabricated in oak, and carefully polished. The glass was then installed in the newly-constructed frame according to conservation standards. Arts and Crafts tenon detail. Close up of tenon in the mortice. Close up of moulding detail. 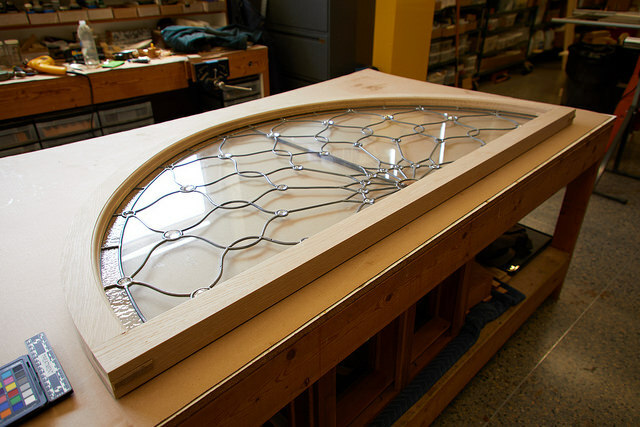 The Center is currently working to create a custom easel style mount that will allow the library to display the window safely on a tabletop surface. 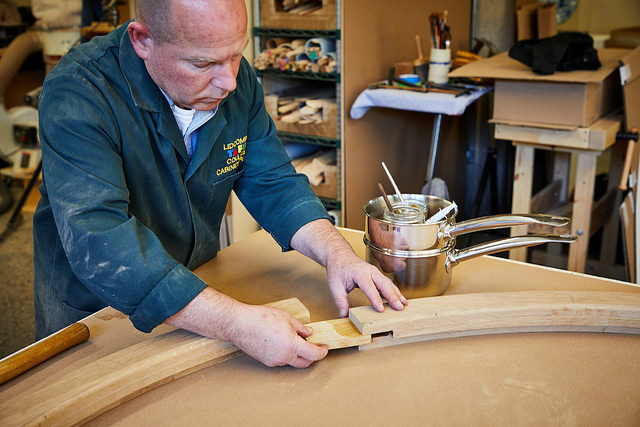 The mount will support the top portion of the window, following the contours of the wooden frame in order to provide adequate support while not being visually distracting. Stay tuned for the final result!